The Place I revisited NAMI Restaurant at Shangri-La Singapore recently to check out their new Dashi Appreciation Class and left with a newfound understanding of Dashi in Japanese cuisine. Located at level 24 of the property, the restaurant boasts a good view of the surrounding lush estate and if you fancy some close interaction with the chef, go for the counter seats. The restaurant is helmed by Head Chef Shigeo Akiba, who hails from Yokohama and has more than 30 years of experience. For ten years, Chef Akiba trained under Dashi Master Masami Honda from Nadaman, Yokohama, and became a Master in his own right. The Food The Dashi Appreciation Class is priced at S$118++, and happens on every last Saturday morning of each month. It is a very elaborate dashi tasting session with a wide range of different grades of dashi. Personally, it really gives me a fresh insight of this ingredient which I have overlooked in Japanese cuisine all these yeas. Do feel free to ask chef any questions along the way! The class will follow with a Shokado Bento Box lunch featuring an array of dishes – appetiser, assorted seasonal sashimi, grilled dish, steamed dish, miso soup, rice and pickles, dessert. If you prefer to drop by for dinner, there is a specially crafted Dashi Menu (S$180++ per person), comprising a medley of small appetisers followed by Hamaguri clam soup with chicken, Seasonal Sashimi served with two sauces, Savoury custard with udon noodles, crab, shiitake mushrooms, Mitsuba leaves with thick sauce, Miyazaki beef loin and Dashi-flavoured rice with miso soup, followed by dessert of Fruit cocktail with plum vinegar jelly stock. Every dish uses different types of Dashi to in a way as to accentuate its flavours. I went for the special Dashi menu during dinner and started with a series of small appetisers. The Sea Urchin on Yam Tofu with Bonito Jelly strikes a chord with my palate as the creamy Uni blends so well with the yam tofu, along with the delicious Bonito soup jelly made from niban dashi, kombu and shoyu. The other two small appetisers are the Baby Squid with Gochujang Cream Sauce and Shrimp with Hosta Grass. One of my favourite parts of a meal is the soup and for this menu, I had the Soup of Hamaguri Clam with Chicken Ball, Lettuce, Eggplant, Shimeji Mushrooms, Carrot. The flavour of the soup is light and comforting in its own way, made with ichiban dashi, a little mirin, sake, light shoyu and shio. Every ingredient here sounds heavy on its own but I guess chef managed to achieve a good balance here. If you dine with me long enough, I rate Sashimi more than seafood per se. I was served the Tuna and Seasonal Flounder with two sauces here, both of which have very different flavour profiles because of the sauces. The sauce with tuna is Niban dashi with katsuoboshi, shoyu, mirin and bonita stock, which has a heavier flavour. In contrast, the sauce with Flounder is made of White Ponzu, shiro shoyu, mirin, and niban dashi. Chawanmushi is nothing new but how about having Udon in your chawanmushi? The Savoury Custard with Udon Noodles is easily one of the favourite for me on the Dashi menu. I love chawanmushi and mushrooms, and this version has a thick texture and is loaded with premium ingredients like Crab, Shiitake Mushrooms, Mitsuba Leaves with thick sauce. The highlight is inevitably the Udon noodles buried within, a very nice twist to the otherwise predictable chawanmushi. Suffice to say, the udon is deliciously cooked in niban dashi, saba dashi and urume dashi. For the Meat Dish, I had the Miyazaki Beef and Eggplant with Kuzu (starch) Sauce. I wish the portion is bigger (I am also a big eater of anything Wagyu) but is still sufficient for my appetite. The Miyazaki beef loin is shabu-ed in niban dashi, mirin, sake and light shoyu, which makes it very flavourful. The beef is tender and there is a decent marbling touch to it. 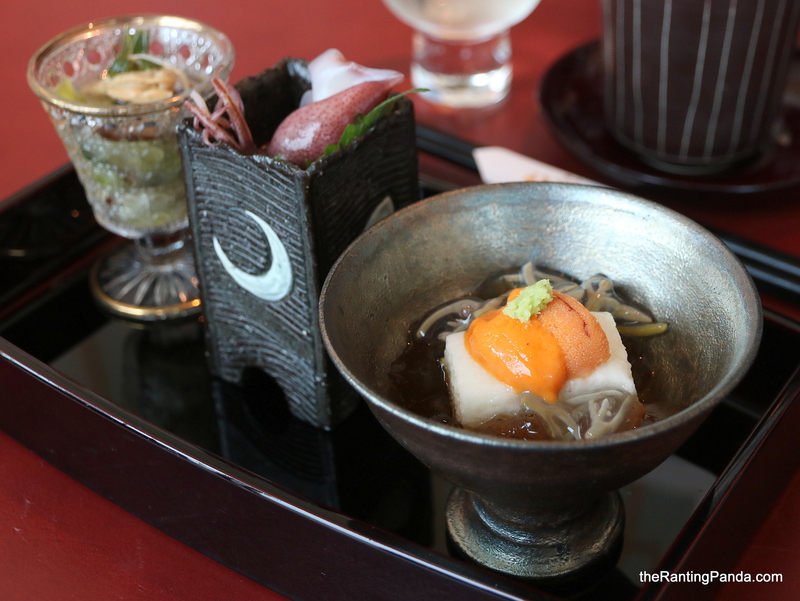 Every course plays on the Dashi theme and the Rice dish is no exception. I had the Dashi-flavoured Rice here, served with Miso Soup and Pickles. The presentation of the rice looks simple but it does not taste plain at all as the rice is steamed with niban dashi, butter, mirin, sake and light shoyu. Great quality rice here, where I finished every grain. As with most fine dining Japanese meals, desserts are nothing fanciful and almost always feature fruits. The dessert for the Dashi menu is a simple Fruit Cocktail with Melon, Strawberry, Orange, Blueberry with Red Bean Paste and Plum Vinegar Jelly Stock. Rants It’s particularly rare that I have no rants in store after a restaurant visit. The restaurant need to try harder at this. Will I Return Again? The Dashi Menu at NAMI is a good glimpse of this Japanese ingredient. The meal is very well-balanced, and I must say it was a much better dining experience than my first visit. NAMI still remains one of the Japanese restaurant I will keep in mind if I am looking to have a good Japanese meal. Make your reservation instantly at Nami here.